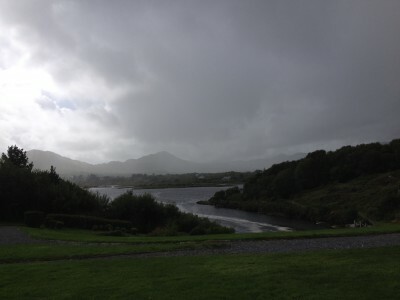 Wild day for an end of summer season wedding in Sneem Hotel… there was determination to have the ceremony outside, which was stunning with the views, but after all the chairs were set up they blew over like dominos! The wedding guests came out, out came the bride, and within five minutes the heavens erupted… here are the dramatic photos just before the rain… I knew it was coming, so packing up quietly and got a quick shot! 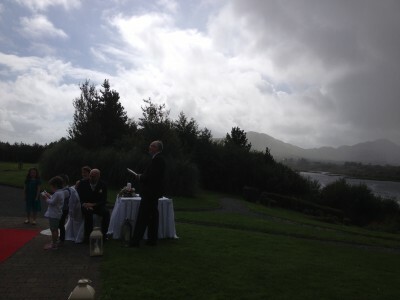 We all raced in, dried off, and the ceremony continued in the Sneem Hotel Foyer! It ended well as the couple were very easy going and guests enjoyed the excitement of it all!